AlienVoIP with Android Mobile Devices enable you to use your Android Phone to make calls over the internet with SIP client apps from Google Play Store instead of traditional mobile operators. You can make cheap VoIP calls anywhere and anytime with access to the internet via Wi-Fi or over 3G/4G. Which Android device does it work on? Alien VoIP is capable to support mass-market mobile phones. In this case, Alien VoIP can be used on your Android phones/tabs like Samsung Note Series, Samsung Galaxy Series, HTC, LG and etc. As long as you installed SIP client apps such as Media Fone 5 or 3CX. AlienVoIP users can make calls from anyplace where there is high-speed Internet access. This is especially crucial for the mobile workforce who often need to remote away from office extension or telecommunicating from home with other employees . Besides, the cost of making these calls will be relatively cheap. AlienVoIP is a validated SIP providers. Our users can get a AlienVoIP SIP account from AlienVoIP.com. and then after configuration with your SIP Client, you can start to making and receiving calls from anywhere and anytime. We are offering the lowest AlienVoIP call rate to you. See how VOIP can help your corporate save even more! Web ASP sdn bhd, ASP license holder with good track record since 2007. We have been providing VOIP /IP-PBX solutions for enterprise. AlienVoIP.com is our flagship VoIP product. 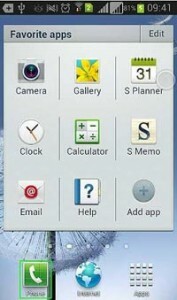 Please contact our team if you need any support to configure SIP client on your Android phone. AlienVoIP android client is connected to AlienVoIP server to provide good quality VoIP calls world wide. The user is able to make voip calls to most of the countries in the world from their android client. AlienVoIP provide the best voice quality with lowest rate, and focus at the asia countries including singapore, thailand, Malaysia, taiwan, Philippines, Indonesia, cambodia, China and others.This application is designed specially to work with alienvoip.com service. 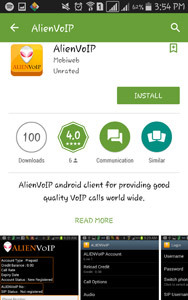 You can download AlienVoIP Android App from Google Play now. Then, get a AlienVoIP SIP account and use our AlienVoIP Android APP to start making and receiving calls all around the world. Enjoy our lowest AlienVoIP call rate right now! 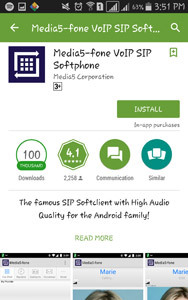 Media5-Fone is an unique SIP Softclient with wideband and HD Voice Audio Quality for the iPhone, iPad or iPod Touch. Beside that, Media5-fone is the best and most comprehensive Mobile VoIP SIP Softphone application that enables you to make and receive free and inexpensive secured phone calls over the Internet using Wi-Fi or 3G connection. You can download Media5-fone Android App from Google Play now. Then, get a AlienVoIP SIP account and use the Media5-Fone SIP Client to start making and receiving calls all around the world. Enjoy our lowest AlienVoIP call rate right now! 3CX is a softphone that allows you to make and receive office calls on your Android Smartphone from anywhere. Save on telecommunication costs by making internal office calls free of charge. Keep your mobile number confidential by using the office caller ID. Never miss an important call by answering office calls from anywhere. 3CX comes with the features including fully support the industry leading SIP standard, G711 and GSM codec support, able to transfer calls, record phone calls and integrated or custom dial pad. 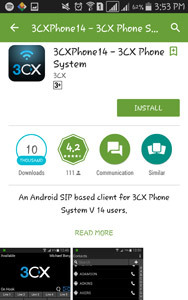 You can download 3CX Android App from Google Play now. Then, get a AlienVoIP SIP account and use the 3CX SIP Client to start making and receiving calls all around the world. Enjoy our lowest AlienVoIP call rate right now! 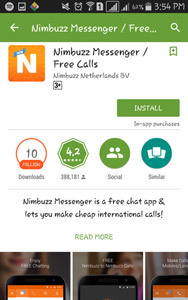 You can download Nimbuzz Android App from Google Play now. Then, get a AlienVoIP SIP account and use the Nimbuzz SIP Client to start making and receiving calls all around the world. Enjoy our lowest AlienVoIP call rate right now! 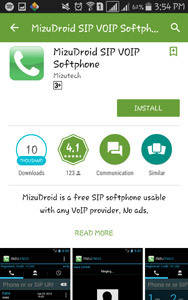 MizuDroid is a free, professional SIP/VoiP softphone from Mizutech. 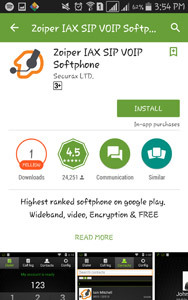 This softphone is an unlocked VoIP softphone for Android mobile phones and tablets based on open standards, compatible with all VoIP providers, software and devices using the SIP protocol. Mizudroid will deliver the best possible call quality for your environment by automatically adapting to your device/network/server and peers capabilities, ranging from HD audio to low bandwidth codecs and fine tuned media parameters. You can download Mizudroid Android App from Google Play now. Then, get a AlienVoIP SIP account and use the Mizudroid SIP Client to start making and receiving calls all around the world. Enjoy our lowest AlienVoIP call rate right now! Zoiper is a free softphone that is easy to setup in your iOS devices. Zoiper enables you to make VoIP calls through your PBX or AlienVoIP SIP Provider with excellent voice quality.Zoiper softphone offers a simple user interface and superb audio quality for smooth Voice over IP experience. You can download Zoiper Android App from Google Play now. Then, get a AlienVoIP SIP account and use the Zoiper SIP Client to start making and receiving calls all around the world. Enjoy our lowest AlienVoIP call rate right now! To use AlienVoIP, the installation is not needed because internet calling is one of the features that has been built in every Android mobile phone.To get started, you can go to the ‘call setting’ and modify the setting under ‘Internet call setting’.You will be requested to fill in all the SIP account details. Thus, get a AlienVoIP SIP account with us and start enjoy the low calling rate.